Why would anyone want to fish for pike? I have heard this question before and the answer is that they are a lot of fun to catch, they are not real finicky about what they will hit or the time of day and they are very good to eat, that’s why. Oh, and they get pretty big, too. Try to get your hand around the back of a 40 inch pike’s head and you will know what I mean. I have always liked pike fishing but until I started regularly fishing in Ontario, Canada I didn’t really know how much fun they were to catch. And, as soon as I learned how to remove the bones from them I found out just how good they taste. Removing the ‘Y’ bones is the key and it’s easier to learn by watching someone else do it than it is if I try to describe it to you. There are a couple of you tube video’s out there if you are interested. Don’t give up if your first few attempts are a little difficult. Once you get the hang of it you will never throw back a nice eater pike. When I say that pike are not picky about what they eat I am not kidding. It is much easier and cheaper to fish with lures instead of live bait so that’s all we use unless we are ice fishing. (Tip: try dead smelt on a tip up for pike, they work & are legal to bring into Ontario). We have used any number of lures to catch pike but one of the cheapest and maybe the best has been the white double twister tail and a jig head. I use the heavier jig heads in the hot summer months as the fish seem to move into the deep, cooler water as the sun gets high in the sky. One of the best places to catch pike has been on the edge of a weed bed right where it meets deeper water. One day I was late getting onto the lake and it was very calm. I anchored the boat in deep water within casting distance of the weeds and caught pike off and on there for more than 2 hours. One of the last fish I got was over 40 inches. My little tape measure only goes to 39 inches so I am not exactly sure how big he was. Most of those fish were taken on a twister tail and jig head, the biggest one hit a blue/green “wild eye” minnow. Over the years soft baits like the wild eye have been pretty good lures. The only down side to them is that pike have a lot of sharp teeth and once the tail end is ripped off the lure it doesn’t work anymore. It just drags sideways through the water. For a long time I always trolled with a good size split body Rapala in perch color. It is still a very good pike lure but there seem to be so many good lures that you almost can’t go wrong. Another good lure that isn’t probably as popular for pike is a Mepp’s or Blue Fox spinner. They seem to work with or without a buck-tail. Sometimes I put a single twister tail on also. To much tail and they don’t seem to move quite right. One of my best days ever of fishing I used nothing but a mid size Blue Fox brass color spinner and a green and orange single twister tail. It was mostly just a lucky day for me but I caught fish on almost every cast. I got so many fish that my two friends were starting to get annoyed with my. I am not knocking any other type of fishing but I am telling you, I have never caught more walleye than pike and I have never caught a 40+ inch long walleye either. 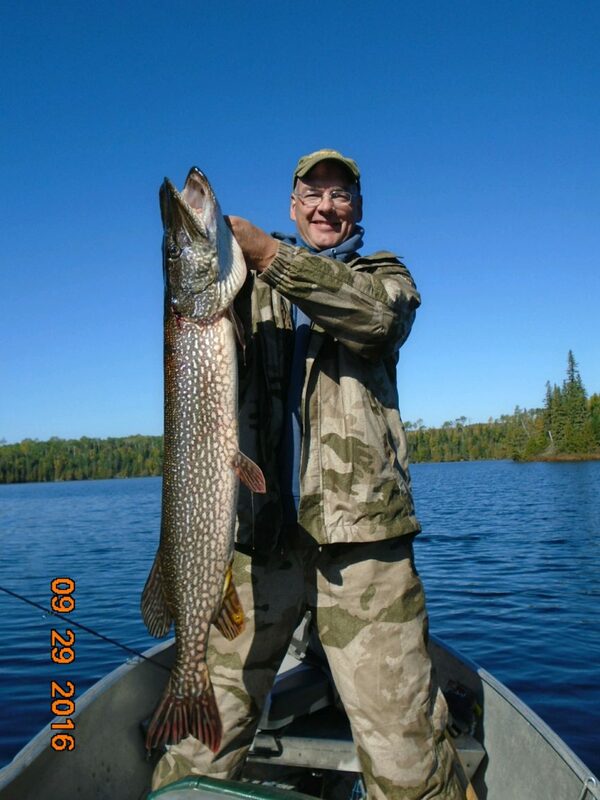 Pike fight harder than walleye and they are easier to catch, what’s not to like (other than the bones)? I don’t know why pike get such a bad reputation (other than the bones) but I don’t really mind, all the more for those of us that like them. The pictured fish was caught one September morning trolling a soft body bait. It was just a hair under 42” & was released. I Finished this article just before heading to Ontario for a late winter/spring ice fishing trip. The day before we left I was shown a couple of You Tube videos that showed pike being caught on tip ups using nothing more than a hot dog for bait. I decided to give it a try, the worst thing that happens is we cook them out on the ice and eat them ourselves. The long and short of it, yes, pike will hit a hot dog hanging under the ice with nothing more than a treble hook attached to it. We also caught pike on a jigging lure with a thin piece of hot dog in place of a minnow. Here are the details? There were two of us, on day one we sat side by side jigging a piece of hot dog in one hole and a minnow in the other. Twice the minnow was “bumped” and then my hot dog jig was hit and the pike landed. We also set up two tip up’s, one with a hot dog and the other with our regular dead smelt. The smelt was the first to produce a fish but by the end of the day both tip-ups caught the same amount of fish. One thing I decided with hot dogs was to wait a little longer before setting the hook. One of the first flags resulted in a lost fish when I set the hook. The hot dog had a long row of teeth marks in it so I dropped it back down. Before I even moved the fish came back and took it again. After a couple of short slow runs I set the hook and landed that fish. During three days of fishing we regularly caught pike on hot dogs or slices of hot dog. I am going to try the slices of hot dog instead of a twister tail this summer.